Well winter is upon us, and with slow progress going on my other large project .... I felt I needed a small ... more likely to complete project. After spending to may hours on flitetest.com I decided to build a quadcopter. After a fair bit of reading I finally ordered the following SM450 Kit from RCTimer. With the free shipping it was the easiest and cheapest way to get all the running gear to New Zealand. I also ordered more props for learning crashes. I went this route to learn and try large quads out, then if I like it I can source better motors and ESC's. I spent hours browsing HobbyKing and reading up on Transmitters and controller boards, I finally decided to get a TURNIGY 9X and receiver. Next it was a no brainer that I would use a KK2 board from Hobbyking. Since shipping was one of the largest expenses I added items to the order to get the best bang for my buck. So I added silicon wire, bullet connectors, nylon nuts and bolts, servo leads, USB simulator lead for the 9X,prop balancer, LED lighting strips, 2 Lipo 3s 2200 25c batteries and other assorted bits and pieces. That order is still to be shipped as some items were on back order. Now please remember this is my first adventure into RC flying besides those little cheap helicopters you see in the mall. So all the items I rattled off above were decided upon based on reading and watching youtube to see what other people did and what they found best. I cannot recommend flitetest.com enough for their great videos and information. 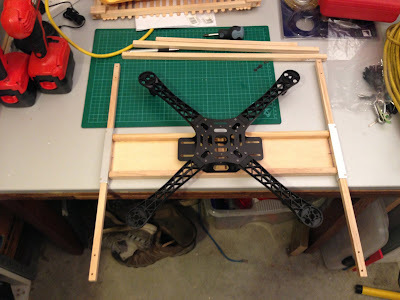 I also cannot count how many quadcopter/ tricopter build videos I watched. Each provided a little more information to the picture of what I wanted to do. I really wanted to do a tricopter, but for my first adventure I wanted something a little more forgiving for a complete novice, so decided on a quad, Then, not sure how I missed it the first time, I found the Flitetest H-Quad. So my main objective with this is to do some aerial video, Once I learn to fly. So the H-Quad looked perfect. Heres the video of the flitetest build. Now I know I will crash since I am learning so I wanted to have replaceable motor mount booms. Easier said than done. There were designs out there that had foldable booms. But due to the limits of the tools I had I needed to make it very simple. After looking for material I finally finished up with the following. The hard bit was finding 4mm ply, I still need to find a cheap source. I visited the local hobby store and they have 100x500mm piece which was perfect for my needs, but only one and at a ridiculous price. I still purchased it as I wanted to start the build. I now had all the materials, "knowledge" and ideas to start my initial build. So using my gold plated piece of 4mm ply as the dimension base the h-Quad will be a 500mm. The first piece of construction was to create a way of having replaceable motor booms... This is where my first idea comes in ... hopefully it will work. .. The booms needed to be replaceable, easily in the field if required, and I wanted to use zip-ties as the fastening mechanism. So using the 16mm U shaped aluminium as the holder the 10mm square rod fits inside, its not a tight fit but the closest I could get. One strip of duck-tape on either the rod or on the inside of the aluminium makes it a snug fit. Which will be more than enough to hold centered in-place while zip-tied. 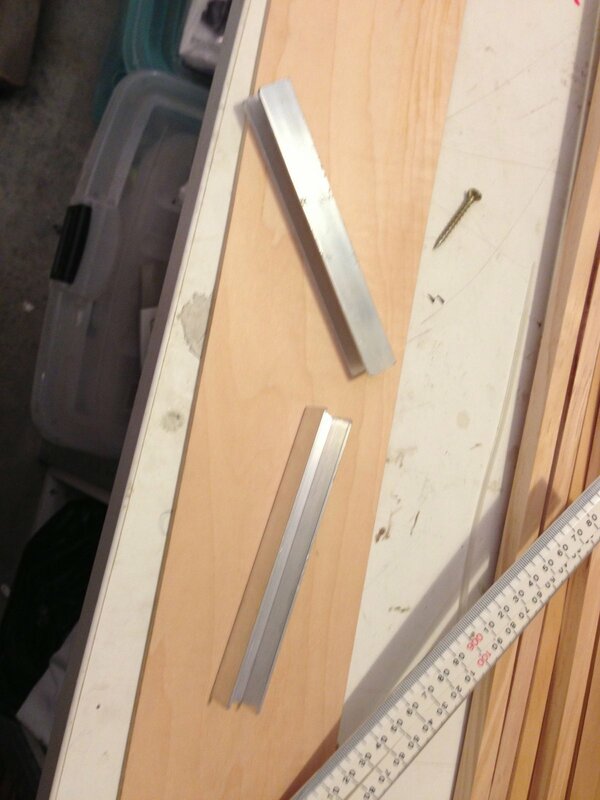 Using the ply as the base I cut 2 lengths of aluminium 130mm long, this allows for 15mm over hang each side. A test fit, as you can see the 10mm rod fits in and there is a 3-4mm over hang. So to allow the ability to zip-tie the booms in place I measured 5mm in from each end then using a 5mm file cut 2 6mm notches. This has two functions, it stop and laterial movement of the booms when zip tied. It also exposes 3mm of the 10mm rod so that when its zip-tied the zip-ties have good contact with the rod to hold it firmly in-place. End mounts mocked up on the plywood base, you can see the notches. The boom mounts were glued in-place, time was taken to make sure that they were square. Using the same 10mm rod the 2 side fames we cut and fitted to the base plate. These were also drilled and screwed to the boom mounts for extra strength. Once dry I also added a crossmember and left a heavy weight on it all while if fully cured. I next cut some motor booms, 500mm long. Below you can see them sitting in the frame. I created 3... planning ahead. Next was to drill the holes in the boom to allow zip-ting of the motors to the booms, The first hold was drilled 10mm in from the end. I also had to drill out the motor mount holes to allow the use of two zip-ties. All three booms done. It will now be an easy process to create more if / when required and I can get the materials from any hardware store. Drilled booms on the drying main frame. A parcel from RCTimer showed up with my SM450 and all the goodies. 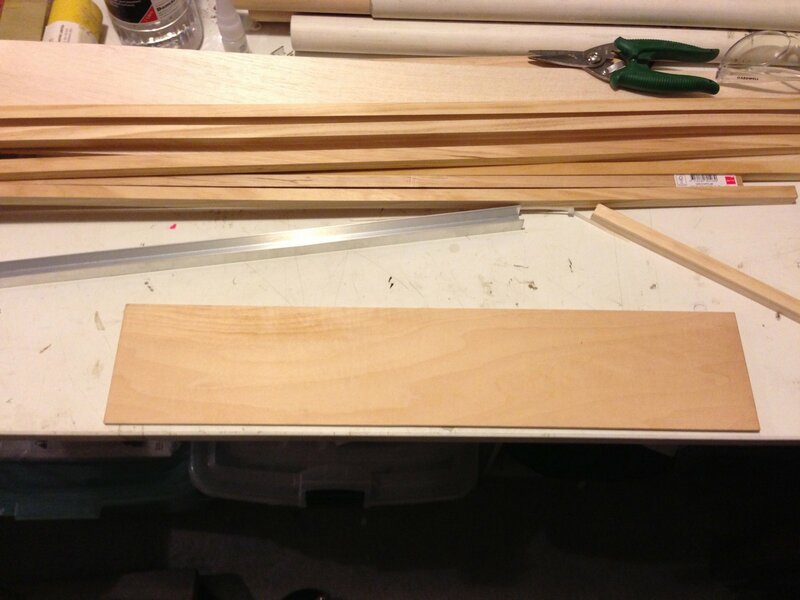 I made the frame up to compare to the frame I am building. My H frame with the SM450 sitting on top. Depending on how my build goes I might Just sell the SM450 frame. I will wait to see how well the flying goes. This evening I added a cross member to the top of the two side rails to add some extra rigidity to reduce any flex. These were glued and also bolted through both the side rails and the bottom plate. This shot also gives a better view of the notched boom mounts. This is how the boom will be secured using zip-ties. 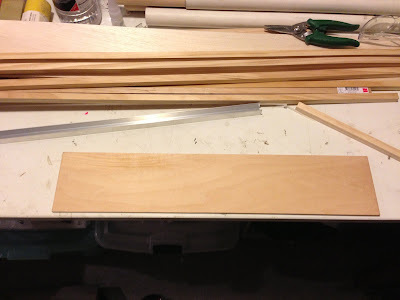 The top balsa-wood plate sitting on the frame. I will have to wait for all the other parts to arrive before deciding the best way to secure the top plate. Testing the CG for the frame, pretty darn close to dead center. I am now waiting on all the other shipments before I can start the electronics of the build.